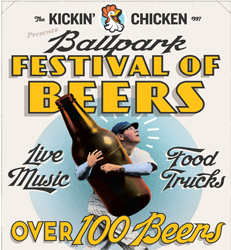 *The Ballpark Festival of Beers is a 21 and over event. Advanced tickets are $30 at any area Kickin’ Chicken; West Ashley, Downtown, James Island, Summerville & Mt. Pleasant (while supplies last) OR $35 at the RiverDogs Box Office or RileyParkEvents.com. Tickets include 18 sampling tickets. Each Brewery will have 3-4 brands available for sample. 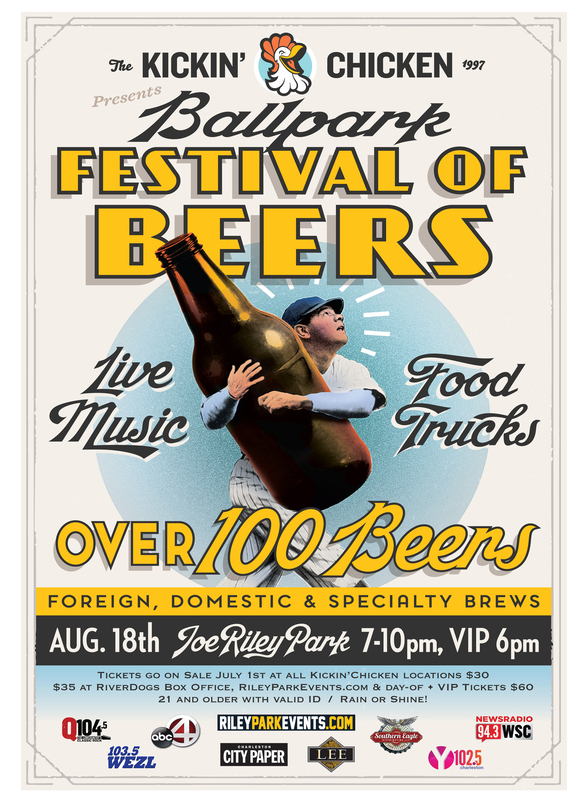 Volunteers needed to pour beer from 5:00-10:00PM. All volunteers must be 21 or older. To sign up to be a volunteer CLICK HERE! $15 DD wristband provides an alternative for non-tasters who wish to enjoy great entertainment, food trucks, corn hole and other fun interactive games. Be a HERO for the day! DD tickets are available for purchase at the stadium box office, August 18th only. Never Compromise. Drink Responsibly. Line up post-event transportation. Green Taxi will be available to get you safely to your next destination. Schedule an Uber or Lyft, ask a friend to join you with the DD wristband option or book a room. The first 2,500 people through the gates receive a commemorative sampling glass. Sampling tickets are included in the admission. There will be water available to clean your glass between sampling. Make sure you drink plenty of water. Summer events can get very warm in the afternoon heat and with the cornucopia of alcoholic beverages that surround you, one often forgets to keep hydrated. You will appreciate proper hydration as the day goes on and especially the next morning. Vendors include Charleston City Paper, GritBox Fitness, SaltWater Cycle, Charleston Ale Trail, Caroline Luxury Apartments, The Wrenn Group, Remember the Times Photo Booth Company, Hoover Mitsubishi, Good Clean Fun Events, Charleston Henna, Costco, Towne Center Tobacco & Wine, Firefly Distillery, Reimagined by Reed, Wardrobe on Wheelz, Charleston Outlaws Rugby, Hops and Nuts Craft and Beer Snacks and more. Blue Plantation Band is an acoustic string band with a diverse variety of authentic musical styles. These styles include Bluegrass, Irish, Folk, Country, Swing, and Jazz. They have created their own niche market and specialize in wedding ceremonies, cocktail hour, dinner rehearsals, oyster roasts, corporate events, festivals, private parties, family functions, birthdays, restaurants, and local music venues. Ben Fagan and the Holy City Hooligans Feel-Good Island Soul.. Let your hair down and your worries drift away. The Holy City Hooligans combine sweet melodies with old soul lyrics and fun and edgy energy of funky rock-reggae groves to deliver a soul quenching experience. If music has the power to create feelings.. why not create positivity! Parking is $5 in all surrounding lots. Carpool and everyone can throw in a buck. All festival-goers must show a valid ID for entry. No children or pets are allowed in the park. 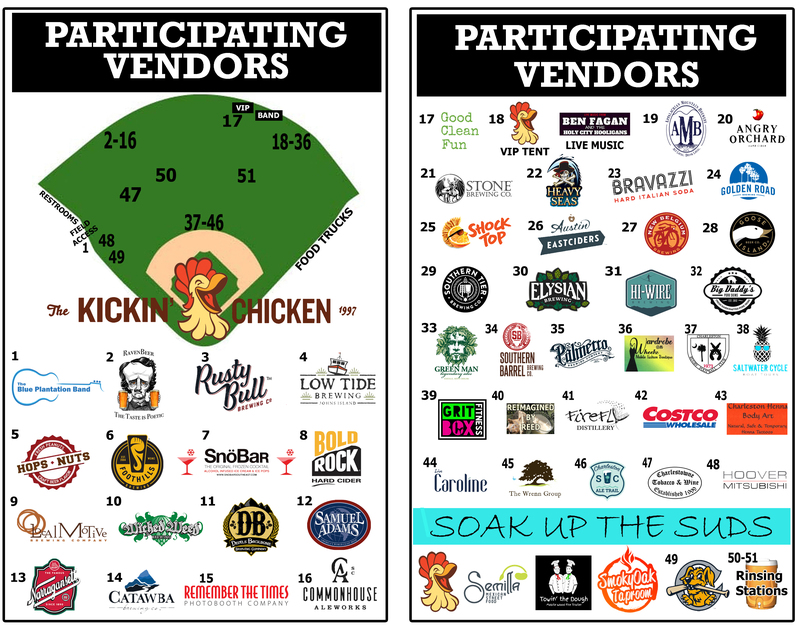 Make plans to head to any of the five area Kickin’ Chicken locations after the festival. As Dan Wilson would say…”you don’t have to go home but you can’t stay here“. This event was posted by cepada.